The ultra-sensory exhibition 'The Secret Garden' by Nathalie Djurberg & Hans Berg will open at the 21st Century Minsheng Art Museum (M21) in Shanghai from 10 September to 23 October 2016. This will be the first solo presentation of the Swedish duo in China. Through the creation of immersive installations consisting of sculpture, light, sound and film, Djurberg & Berg create fictional landscapes full of strange delights and encounters, thrusting visitors into mysterious worlds of feverish dreams, psychedelic sunsets and expanding universes. The Secret Garden, a recent installation from which the exhibition takes its name, fills the museum with giant leaves, bluebells, golden-capped acorns, gelato coloured cushions and dripping ice creams. Tied together with neon lighting and sound, and presided over by a shaman rabbit, it is the stage set of the subconscious, only activated fully by each audience member’s internal direction. 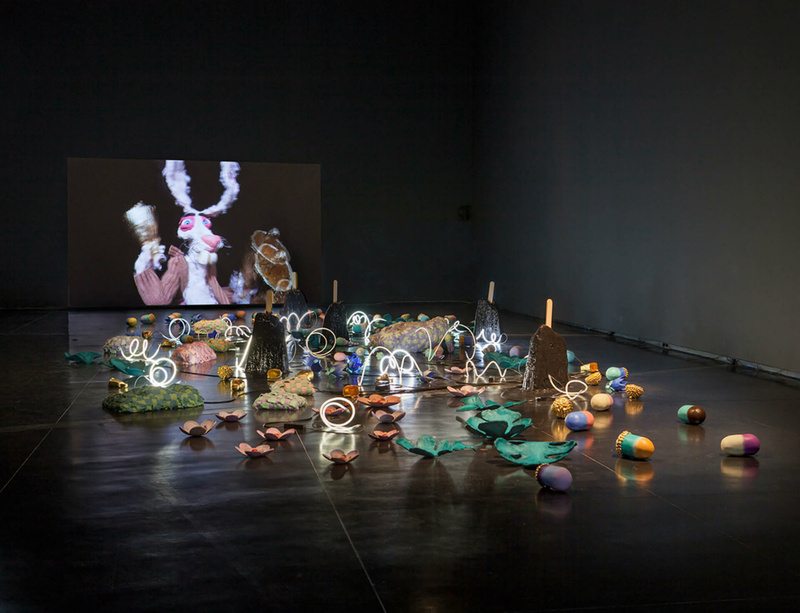 The Secret Garden at M21 follows recent presentations of the work in Australia at Australia Centre for Contemporary Art (ACCA), Melbourne in October 2015 and at the Perth Institute of Contemporary Arts (PICA) in February 2016. Another installation by Djurberg & Berg, A Thief Caught in the Act, was recently presented as part of Art Basel in Hong Kong's 2016 'Encounters' sector. Image: The Secret Garden, 2015. Installation view, Australian Centre for Contemporary Art, Melbourne, Australia. Courtesy the artists and ACCA.